Heat the oil in a wide-bottomed pan. Sauté the onion and all the other ingredients up to and including the thyme for approx. 5 mins. Stir in the saffron. Pour in the wine and stock, bring to the boil, reduce to approx. half the amount. Scrub the mussels under running water, remove the beard, discard any mussels that are already open. Cover and simmer the mussels in the stock for approx. 5 mins. over a low heat until they open. 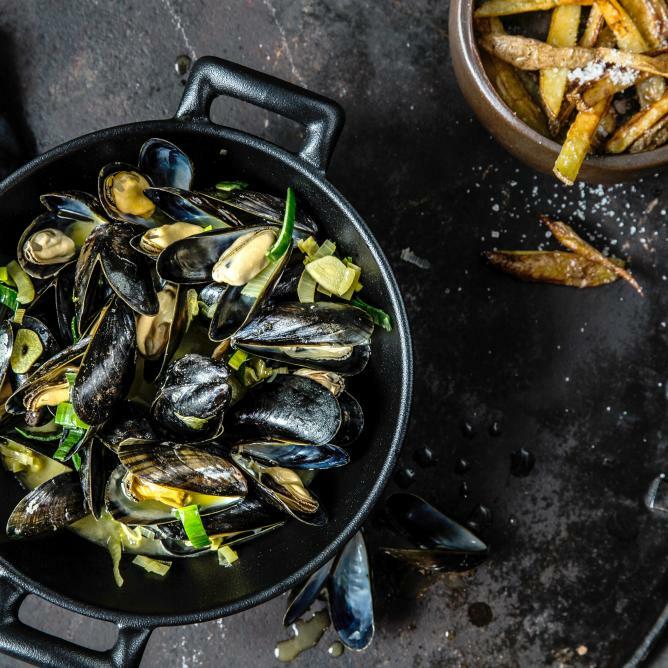 Discard any mussels that have not opened – these are inedible. Add the cream, heat gently. Place the potatoes in a bowl, add the oil, spread onto a baking tray lined with baking paper. Bake for approx. 20 mins. in the centre of an oven preheated to 220°C. Remove the tray, turn the fries and bake for a further 20 mins. Salt the fries shortly before serving and serve alongside the saffron mussels.